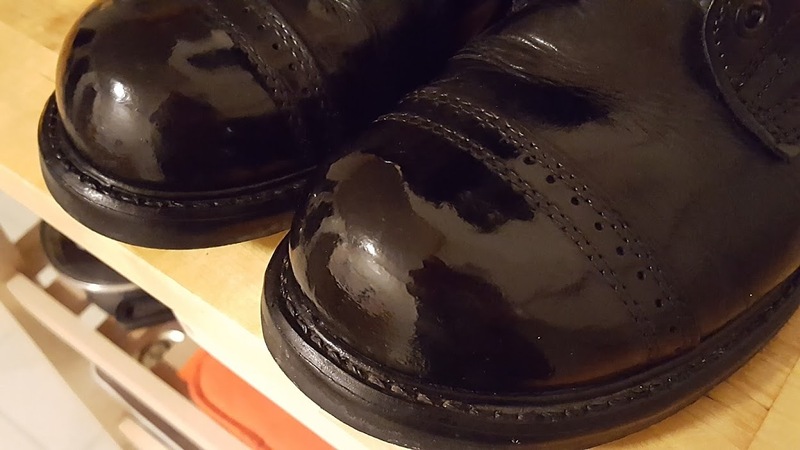 Hey, I just got my parade gloss prestige kiwi boot polish and it doesn't seem to be working. my standard boot polish has been working great, why can't I get this stuff to work? Will somebody please help me?!?!?! 1. Lose the parade gloss and go back to what you were using.. If it isn’t broke, don't fix it. 2. I use a white cotton t-shirts for 2 reasons. 1. I can visibly see when there is polish on my polish rag. 2. Cotton balls can leave fibers imbedded in the polish on your boot. I've seen it happen. 3. Practice makes perfect. Practice you technique. I've done it so many times I can tell by feel when I'm in the groove. 1. Yes! “Parade Gloss” has a different formula with a different wax content than regular Kiwi. Parade Gloss is a shortcut for civilians to get a better buff shine, but it doesn’t work well for a spit shine. 2. If you see fibers embedded in the polish on the shoe from cotton balls, than it’s a virtual certainty that there were no cotton balls used. Instead, they used “cosmetic puffs,” the margarine of the cotton world. Look like cotton balls, but they aren’t. They are polyester. (They will also scratch the shine). Accept no substitutes! Either genuine cotton balls or 100% cotton white cloth, be it t-shirt or diaper. 3). Shining shoes is just like trying to appear in concert at Carnegie Hall - there can be no true success without practice. Dump Kiwi and use Lincoln. Been using the stuff for years. I bet the member who post the initial thread is just buffering and not spit shinning. To clarify we should ask. yes, I do use water when I polish my boots. Kiwi, heat gun, cotton cloth & cold water. Lincoln Wax is the best I've used, but I can't reliably find it in my area. Parade Gloss has more silicone in it (or something like that) and, as stated, doesn't work as well for spit shining. I only use regular Kiwi because I can find it in Walmart, cotton balls, and water. I've tried all sorts of tricks with heat guns and lighters, and just stick with the basics. going to suede, just make it black suede to insure they look continue to look sharp vs. bizarre beige ones. I shine my boots about once every 6 months. With the heat gun, its about 10 minutes a boot. 20 minutes or so every six months? I have that kind of time. Not that suede boots wouldn't be much less mx. Eclipse, have ever had to clean suede boots? They are far from "maintenance free". I brush shine boots and spit shine low quarters. Neither is very time consuming at this point. I always find it odd that people who spend the most time bloviating about how shining footwear has some terrific character-building quality wear corfams. You won't hear me talking about "character building" when it comes to boot shining (or ironing my shirts). Nope. Its a detail, just like the other stuff. I've never seen Lincoln Wax at Walmart but that may be a regional thing. Only place around here that carries it is a store that sells duty, motorcycle, and work boots.